Blu-Ray Review: The Premonition (1976) | "DESTROY ALL FANBOYS!" As with The Witch Who Came From the Sea, the second film in Arrow Video’s mostly great American Horror Project Volume 1 collection isn’t really a traditional genre flick at all. Robert Allen Schnitzer‘s 1976 film, The Premonition is more of a visually intense psychological thriller with a supernatural theme running through it. Don’t go into this one expecting gallons of blood and guts all over the walls and floors, folks. The film is a more deliberately paced thriller with a somewhat complex “child in danger” plot that seems to have been rewritten over another idea for a competent family drama of the week TV movie. That’s not to say it’s not watchable at all, mind you. In fact, if you’re in the mood for a solid rainy night’s gloom-fest it’s a great film to sit down in front of with a friend or two. It’s just that the film seems geared to scare those more easily gullible about psychic phenomena more than be entertaining to those who find that stuff silly and not at all frightening. Still, you get the always weirdly enjoyable Richard Lynch as Jude, a carnival mime/clown and the unbalanced paramour to the lovely but somewhat mentally unstable Andrea (Ellen Barber) who plays the mother of a young girl named Janie (Danielle Brisebois) who was taken away from her and adopted by the Bennetts (Edward Bell, Sharon Farrell. Let’s just say Andrea wants her daughter back and is willing to do almost anything to make that a reality. It’s easy to side against her from the start but the film tosses in a neat monkey wrench or three into the works that will keep your eyes and ears on their toes. When Andrea tracks Janie to her school to reestablish contact, Sheri Bennett shows up to whisk her adopted daughter away before she gets a good look at her real mom, but has a strange feeling that will only get worse as events transpire. Shortly afterwards, Sheri has the first of a few “psychic” episodes – visions about Andrea and Jude raging and at some point coming to take Janie away. Let’s just say the home life in the Bennett household gets flipped on its back like a bullied turtle and to make matters worse, Professor Miles Bennett has been spending time with a pretty (and pretty damn smart) Dr. Jeena Kingsly (Chitra Neogy) who teaches a class in parapsychology. Miles’ attentions go from friendly curiosity to almost too flirtatious, which means there is some trouble brewing on the domestic front. Indeed there is, as Sheri’s instability starts showing up in a few dangerous forms as she and Andrea get closer and closer to meeting. There’s a kidnapping attempt, Jeff Corey as a detective doing some digging, Sheri, Jude and Andrea’s mental states deteriorating and a whole lot of screaming, nifty visual trickery and a tiny bit of death before the closing credits roll. As usual, Arrow’s new restoration job is excellent overall. Of the three films in the set, The Premonition is the most clean looking (in my opinion). Special features include director commentary, “Pictures from a Premonition,” featuring Interviews with Schnitzer, Composer Henry Mollicone, and Cinematographer Victor Milt. There’s an interesting archival Interview with Star Richard Lynch (who died in 2012) where he discusses his long career and dedication to his art. It may come off as pompous to some viewers, but Lynch was clearly a man who went into acting as a lifelong goal and not just as a way to become a “celebrity”. For those who want some extras worth extra seat time, you’ll get three of Schnitzer’s short films (Terminal Point, Vernal Equinox and A Rumbling in the Land) to check out along with a number of his excellent Peace-themed TV ads from the 60’s. Outtakes, Trailers and TV spots make up the rest of the disc features and as usual, my review disc was lacking the collectible booklet and reversible cover art sleeve, so those can’t be commented on. Still, while it’s not a pure horror film (unless you’re freaked out by psychodrama and films in which children are put in danger), the unsettling tug of war between the two psychically connected mothers can be pretty compelling stuff. Lynch’s scenery chewing is equaled by Barber’s turmoil-packed performance (she’s like a bolt of lightning in a red dress), and despite some hiccups in the plot, the film ends up being pretty memorable for a trip into the 70’s. As for the final film in that box set, wellllll… Malatesta’s Carnival of Blood is quite the crazy slice of bizarre that has to be seen to be believed. And even then you’ll probably still be more confused that scared. More on that shortly, folks. I just need to watch it one more time to be sure I didn’t hallucinate anything. 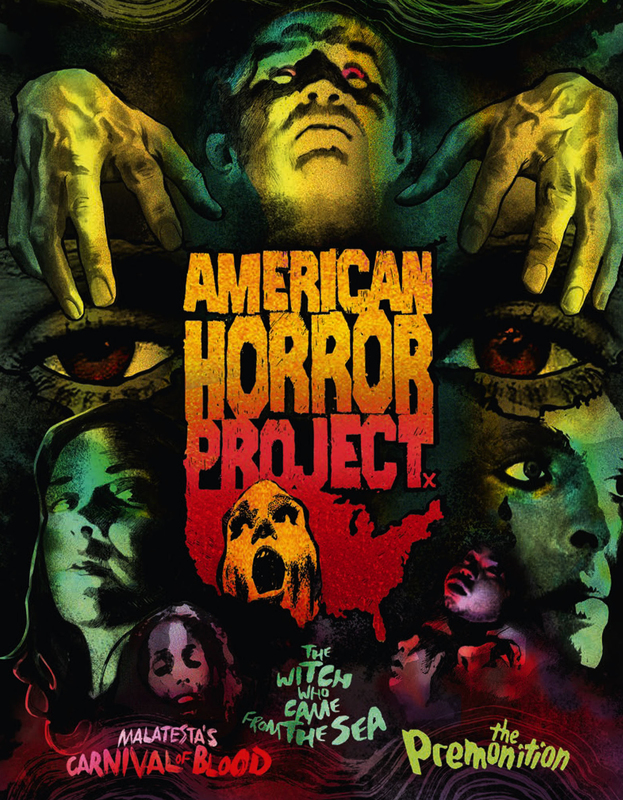 This entry was posted in 2016, Commentary, DAF, Features, Updates and tagged 1976, American Horror Project, Arrow Video, Blu-Ray/DVD, BUY THESE FILMS!, Collectibles, Horror, Horror Films, Movie Clips, Movie Trailers, Movies, MVD Entertainment Group, MVD Visual, Nostalgia, Reviews, The Premonition, YouTube by geelw. Bookmark the permalink.